Dragon Ball 3-in-1 Volume 1 cover image is courtesy of barnesandnoble.com. Dragon Ball is a long-running Japanese manga series written and illustrated by Akira Toriyama. Originally serialized in Weekly Shonen Jump from 1984 to 1995, Dragon Ball is comprised of 519 individual chapters. Various anime series have been adapted from Dragon Ball, most notably Dragon Ball Z, which some believe boosted the popularity of Japanese anime amongst Western audiences. 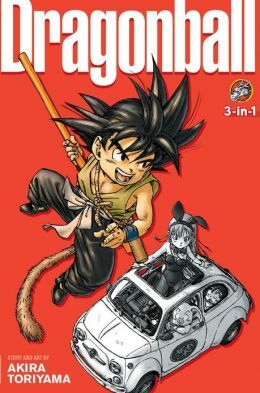 VIZ Media is Dragon Ball’s North American publisher, and it has been publishing individual graphic novel collections of the series for some time. Now, VIZ Media is republishing the series in its “3-in-1 editions,” which collect three individual graphic novels in one large-sized paperback edition. Dragon Ball 3-in-1 Edition, Vol. 1 contains Dragon Ball Volume 1: The Monkey King (Chapters 1 to 11), Volume 2: Wish Upon a Dragon (Chapters 12 to 24), and Volume 3: The Training of Kame Sen’nin (Chapters 25 to 36). Chapters 1 to 36 cover the introduction of the hero, Son Goku, and the start of his adventures to the beginning of a famed martial arts tournament in which Goku is participating. In Dragon Ball, Vol. 1, Bulma, a young woman and genius inventor, meets Son Goku. Goku is a monkey-tailed boy who both learned kung-fu and inherited a magic staff from his late grandfather, Son Gohan. Bulma is looking for the seven Dragon Balls, precious orbs that when put together summon a powerful dragon. This dragon is Shenlong, the Dragon Lord, and when he appears because of the union of the seven Dragon Balls, he grants one (and only one) wish. Bulma convinces Goku to join her on her quest, and they meets lots of strange, new people: Kame Sen’nin “the Turtle Master,” Oolong the shape-shifting pig, and Yamcha and Pu’ar, among many. In Dragon Ball, Vol. 2, Goku, Bulma, and Oolong meet more strange people: some good, some bad. The quest for the Dragon Balls reaches an unsatisfying conclusion. In Dragon Ball, Vol. 3, Goku meets Kuririn, a young martial artist and Shaolin monk. They become rivals and then, friends as they train under Kame Sen’nin. After some truly grueling training, Goku and Kuririn enter the 21st Tenka’ichi Budokai (“Strongest Under the Heavens”) martial arts tournament. THE LOWDOWN: I first heard of Dragon Ball as an anime, having no idea that it was also a manga. Years later, VIZ Media sent me an Akira Toriyama manga for the first time (maybe Dr. Slump). Then, I learned that Dragon Ball was not only an anime franchise, but that it was also a hugely-influential manga. After reading Dragon Ball 3-in-1 Edition, Volume 1, I am ready to be a regular reader of Dragon Ball, if not also a Toriyama fanboy. Dragon Ball is wild and silly like an old American Saturday morning cartoon. Toriyama is as inventive and as imaginative as classic American and European comic books; think of someone who blends Carl Barks, Jack Kirby, and Peyo into one super-cartoonist. Dragon Ball is sprawling and epic in the way we’ve come to expect of shonen manga like Naruto and One Piece, whose creators Dragon Ball both inspired. Mississippi, goddamn! Dragon Ball is one of the best manga and comic books I have ever read. Take that for your recommendation. POSSIBLE AUDIENCE: Readers looking for classic “all ages” comics that can be read by young and old will want the Shonen Jump classic, Dragon Ball 3-in-1 Edition.